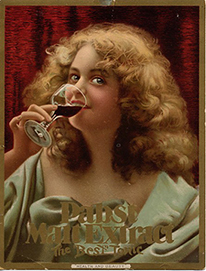 In my effort to write my version of narrative nonfiction I will center the book on the Pabst Tonic marketing director A. Cressy Morrison (1864-1951). Cressy arrived from the East coast in 1889 and worked at Pabst til 1897. Those were the years when Pabst was the biggest brewery in the world. He was young, age 24, when he arrived in Milwauee. What’s amazaing about Cressy is that when he was in charge of promoting the Pabst Tonic the brewery produced a series of pamplets called the ‘Secret’ booklets. Cressy had to be the writer for this series though I continue to search for evidence to establish that fact. If he did write them, he wrote well. They are fun to read, and actually funny at times with the humor included in them. Cressy played a signficiant role at Pabst in its new promotion department, located not too far from the Captain’s office. Join Thomas Mickey as he writes a book about the Pabst Brewery’s medicinal beverage Pabst Extract, first produced in 1887 and for decades sold in pharmacies across the country. Welcome. Please enter your email address here to subscribe to Pabst Extract and receive notice of new posts by email. Thank you for visiting.